This section takes a look at the medicinal chemistry of antiviral drugs – looking at their fundamental structures to elucidate more about their functional properties. Viruses are infectious agents that are capable of replicating only when inside the living cells of living organisms. Diseases such as influenza (flu), measles, mumps, rubella, SARS, AIDS, and chicken pox are caused by viruses. Rhinoviruses have been identified as responsible for most cases of the common cold. Norovirus is commonly referred to as ‘the winter vomiting bug’ in the UK. The Ebola virus poses a serious threat to humans. The 1918 flu pandemic, nicknamed the Spanish flu resulted in the death of 3-5% of the human population at the time. Because viruses have the potential to devastate the human population, it is important that we have means of treating viral infections effectively. 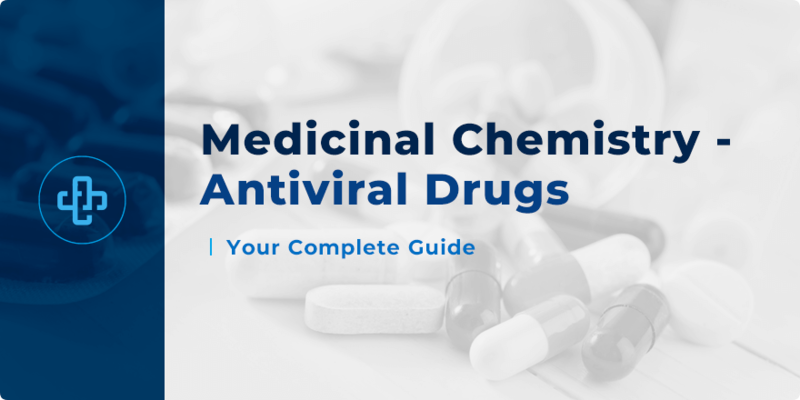 The pharmacology of antiviral drugs is discussed in greater detail in these articles. There is also an article dedicated to drugs used in HIV. This article will discuss the chemistry of specific examples of drugs. Before proceeding, it is also highly recommended that you quickly review basic virology. As in previous medicinal chemistry articles, we invite you to look at the structures of the drugs featured in this article and think about the possible ways the compounds may be synthesised and the drug design strategies that may have been employed to design the drug. The compounds in clinical use today combat viruses by acting on key stages of the viral cycle or they interfere with the genetic material of the viruses. Key stages of the viral cycle that can be targeted include cell entry and cell release. Currently, most of these drugs are designed to help deal with HIV, herpes viruses, the hepatitis B and C viruses, and influenza A and B viruses. At present, there are fewer drugs to treat infections of RNA viruses compared to DNA viruses. Research into drugs that can treat other viruses that pose serious threat to humans is an active area of research. Viral variation and the fact that viruses utilises the host’s biochemical machinery to replicate makes the task of finding effective antiviral compounds a formidable one.We will now look at the medicinal chemistry of antiviral drugs. Enfuvirtide (Fuzeon®) is a peptide drug consisting of 36 amino acids with a molecular weight of 4492.1 g mol-1. Enfurvitide was approved by the FDA on March 13, 2003 as the first HIV fusion inhibitor. Recall that gp41 is a transmembrane viral protein that is involved in entry of the virus to host cells. Enfuvirtide binds to gp41, ultimately inhibiting fusion.The drug is administered twice daily by subcutaneous injection. Enfuvirtide exhibits decent activity against HIV-1 but low HIV-2 activity as demonstrated in vitro. As one would imagine, the synthesis of enfuvirtide is a long and costly process. There is a need to develop cheaper and structurally simpler HIV fusion inhibitors. Unlike enfuvirtide, maraviroc is a compound that acts on a molecular target found on the host cell rather than the virus itself. Like enfuvirtide, maraviroc is primarily used in HIV treatment at the cell entry stage. The C-C chemokine receptor type 5 (CCR5 receptor) is a receptor found on the surface of leukocytes. Maraviroc belongs to a class of antiretroviral drugs known as CCR5 receptor antagonists. More specifically, maraviroc is a negative allosteric modulator of the CCR5 receptor.Recall the role of viral gp120 proteins during HIV cell entry. The binding of maraviroc to CCR5 blocks viral gp120 protein from associating with CCR5, thus hindering entry. Maraviroc was developed from the lead compound shown above. Although the lead compound and maraviroc are equipotent, the lead compound blocked hERG ion channels. Compounds that block hERG ion channels are often associated with unwanted cardiac side effects. Many analogues of the lead compound were synthesised in order to find a compound that is potent and does not block hERG ion channels. Eventually, maravirocwas synthesised and was found to fulfilthese criteria. Before proceeding, we recommend that you to go over the basics of the mechanism of influenza virus infection. This segment will focus on the synthesis of the anti-influenza compound, oseltamivir (Tamiflu®). Oseltamivir is the first orally active neuraminidase (NA) inhibitor. The compound is in fact a prodrug. Hydrolysis of the ester takes place in the body to give the active carboxylic acid derivative of oseltamivir. 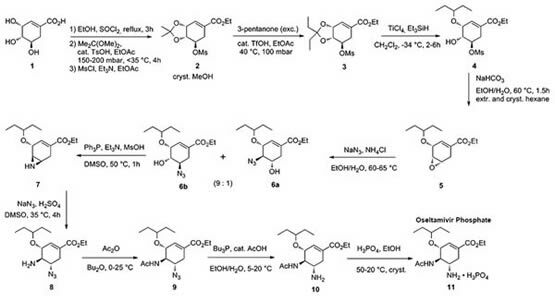 Computational medicinal chemistry had a role to play in the development and design of oseltamivir. As a structural analogue of a key intermediate in sialic acid/NA chemistry, oseltamivir serves as a competitive inhibitor of viral NA by binding strongly to the active site of NA. This interaction ultimately prevents the release of new viral particles from the host cell. Other methods that don’t use shikimic acid as a starting material have also been developed. This was mainly driven by the decreased supply of shikimic acid. The B.M. Trost research group used a commercially available lactone as a starting material. Their synthesis also features the use of organometallic catalysis. The E.J. Corey group used 1,3-butadiene and acrylic acid as starting materials, with an asymmetric Diels-Alder reaction as one of the first crucial steps. Angew. Chem. Int. Ed., 2008, 47 (20), pp 3759–3761. J. Am. Chem. Soc., 2006, 128 (19), pp 6310–6311. The medicinal chemistry of antiviral drugs that are involved in viral synthesis will now be discussed. Viral processes involving nucleic acids are commonly targeted in antiviral therapy. Aciclovir (acyclovir) is an analogue of the guanosine nucleotide. Unlike guanosine, the sugar ring is incomplete. Note that the 3’ hydroxyl is missing in aciclovir. Aciclovir is triphosphorylatedin virally infected cells to give the active compound, so aciclovir is a prodrug. In a previous article, we described bioprecursor prodrugs that are activated by oxidative and reductive processes. Aciclovir is a bioprecursor prodrug that is activated by phosphorylation. We will now explain the pharmacology and mechanism of aciclovir. Aciclovir is primarily used for the treatment of herpes simplex virus infections. Recall the role of thymidine kinases in DNA synthesis in the human body. Herpes viruses synthesise their own viral thymidine kinase. The first phosphorylation of aciclovir is facilitated by thymidine kinase. Researchers have discovered that viral thymidine kinasesare many times better at phosphorylating aciclovir compared to human thymidine kinases. Following phosphorylation by viral thymidine kinase, aciclovir monophosphate is phosphorylated by cellular enzymes to eventually form the active aciclovir triphosphate. The active compound is more selective against viral DNA polymerases. Aciclovir is therefore, highly selective for the virus. Aciclovir acts by preventing DNA replication and it does so through two ways. Recall that DNA viruses replicate using a DNA-dependent DNA polymerase. Due to its similarity with guanosine, viral DNA polymerase ‘mistakes’ it for a building block so the drug binds to the enzyme, thereby inhibiting the enzyme by acting as a competitive inhibitor. Aciclovir also acts as a chain terminator. The triphosphorylated aciclovir is incorporated in viral DNA during replication. Since the 3′ hydroxyl is missing, further addition of other DNA building blocks is prevented. Due to poor water solubility and poor oral bioavailability, prodrugs and analogues with better pharmacokinetic properties have been developed using medicinal chemistry strategies. Valaciclovir is an ester prodrug of aciclovir. More specifically, valaciclovir is an L-valyl ester prodrug. Gut absorption is enhanced compared to aciclovir. Ganciclovir is an aciclovir analogue that possesses an extra hydroxymethylene group. Ganciclovir is not a good substrate for chain elongation. Furthermore, ganciclovir also serves as a competitive inhibitor of viral DNA polymerase. At present, there are very few broad-spectrum antiviral compounds that have reached clinical use. Ribavirin is an example of a broad-spectrum antiviral. Ribavirin is a synthetic nucleoside that demonstrates antiviral activity towards many RNA and DNA viruses through many mechanisms. Taribavirin is a prodrug of ribavirin currently in Phase III clinical trials. Taribavirin is more specific for the liver. The specificity for the liver is thought to be due to the basic property of taribavirin’samidine group which inhibits entry into erythrocytes. Another contributing factor of taribavirin’s specificity is possibly the higher concentrations of enzymes that can convert amidine groups to amides in the liver. Amantadine and rimantadine belong to a group of antiviral drugs known as adamantane derivatives. Adamantanes are primarily used against flu, acting on viral penetration and uncoating. The pharmacology of the adamantanes is discussed in this article in greater detail. As the name suggests, the adamantane derivatives contain the adamantane ring. The adamantanes can inhibit viral infection by blocking a viral ion channel protein known as matrix (M2) protein at lower concentrations. Thus the adamantanes are ion channel disrupters. Adamantanes also have another antiviral mechanism. Due to the basic nature of the compound, the adamantanes buffer the pH of endosomes at higher concentrations of the drug thus preventing the acidic environment needed for viral haemagluttinin (HA) to facilitate the fusion of the viral membrane with the endosome’s. This concludes the article on the medicinal chemistry of antiviral drugs. Many interdisciplinary research groups are working on the development of antiviral drugs. The development of compounds for the treatment of viral infections with limited choice of drugs remains a challenge. Nature Reviews Drug Discovery. 2002, 1, pp 13-25.